TUNIS, Apr 20 2012 (IPS) - Thousands of centre-left demonstrators violently clashed with police in street battles that completely shut down central Tunis last week, left scores seriously injured and underlined the persistent divisions in Tunisian society. Thousands of Tunisians have protested against a government ban on street demonstrations. Credit: Jake Lippincott/IPS. The demonstrations were organised by several political parties, unions and human rights groups. Ostensibly meant to mark the national Martyrs Day celebration, their more immediate aim was to challenge the recent government ban on protests in central Tunis. The police response was violent and seemingly disorganised, and called into question both the government’s democratic credentials and its ability to maintain order even in the heart of Tunis. The trouble started when the Tunisian government, which is dominated by the moderate Islamist party Ennahda, justified its ban on all demonstrations late last month, by painting it as an effort to ‘maintain order’ on the eve of the economically vital summer tourist season here. However, the centre-left opposition saw this ban as a blatant attack on political freedom. After a small protest against unemployment was violently crushed by police on Apr. 7, the opposition began organising a massive protest to challenge the ban and the government. The demonstration began on the morning of Apr. 9 and was attacked almost immediately by police wielding truncheons and tear gas guns. The uniformed police were supported by masked young men in plain clothes (generally known in Tunisia as “militia”) who also enthusiastically attacked protesters and journalists with sticks and stones. Several hundred protesters built barricades and threw stones at security forces. By the end of the day scores of people, including French journalist Julie Schneider, had been hospitalised. The excessive use of tear gas, involvement of militia and intentional attacks on journalists and bystanders with cameras brought to mind the worst excesses of the former dictator Zine el Abidine Ben Ali and has proved to be a public relations disaster for the governing coalition here. Due to extensive public backlash, the government rescinded the protest ban. Recent polls have indicated that the Tunisian government is still popular, but facing increasing challenges. According to the Tunisian National Association of Statistics, total unemployment here has risen 0.6 percent, going from 18.3 percent in the second quarter of 2011 to 18.9 this February. The unemployment rate for college graduates is even worse, rising from 29.2 to 30.5 in the same period. While continued economic problems could be eroding Ennahda’s support, they have also been caught in the middle of an increasingly vicious cultural conflict between hard-line Salafis on the one hand, who want to scrap the Tunisian constitution and replace it with sharia law, and leftists who want to preserve Tunisia’s socially liberal traditions and increase protections for women and minorities. Ennahda’s official ideology calls for inclusive parliamentary democracy loosely guided by moderate Islamic principles. During the election this mix allowed Ennahda to gain the support of a broad swathe of Tunisian society, from hard-line Salafis to non-practising Muslims. However, now that it has to govern this sprawling voter base, Ennahda and its coalition allies are struggling to keep disparate constituents happy. Earlier this month, in what was seen as a nod to the party’s more conservative supporters, the government spoke approvingly of a decision by a provincial judge to sentence two young men to over seven years each in prison for insulting the Prophet Muhammad on their facebook pages. This decision to punish the two men was supported by many mainstream Tunisians but outraged intellectuals and many sexual and religious minorities who fear that this is the first step in a broader campaign of intolerance. Furthermore, in recent months Salafi vigilante groups have been attacking people they see as ‘un-Islamic’. While the Salafis are not officially supported by the government, many leftist Tunisians accuse the authorities of turning a blind eye to their violence. Saif Bjaoui is a young queer activist who participated in the Apr. 9 protest. When asked what motivated him to attend the demonstration, he told IPS more than anything else it was opposition to Ennahda and what he sees as their intolerant policies. He mentioned the recent court case and added, “I’m afraid of Ennahda, because they are trying to take our rights, Samir Dilou (the current Tunisian minister for human rights, and an Ennahda party member) said last month that gays are ‘sick’,” he said. Early last February, Dilou told a local talk show that gay people do not deserve freedom of expression because they are mentally ill.
Two days after the protest, Rached Cherif, a member of the Tunisian League of Humanists, told IPS that the actions of the Ennahda government were putting certain segments of Tunisian society in danger. “The government is tolerant of Salafi activism which is aimed directly at minorities like Christians, Jews and gays – this puts these minorities directly in danger,” he said. “The government is friendly with the Salifists but they brutally suppressed the peaceful leftist protest (on Apr. 9),” he lamented. Despite the significant number of Tunisians who support leftist parties and minority rights, it is clear that many people here also support Ennahda’s conservative policies and oppose increased rights for sexual and religious minorities. Cherif believes that many Tunisians are frankly “intolerant” of social liberalism, which might hurt the new democracy’s chances at survival. “Democracy without minority rights is not democracy,” Bjaoui added. On Apr. 10, a day after the repression, demonstrators returned to the main drag in downtown Tunis accompanied by a group of opposition assembly members. Many of the rank and file protesters wore bandages from injuries sustained the day before. This time, however, both demonstrators and police showed restraint and the protest went on loudly but peacefully. 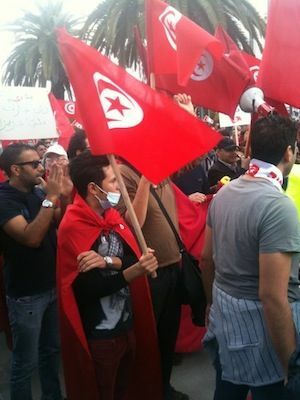 The next day, the government officially declared that protests were once again legal in central Tunis. The immediate crisis caused by the protest ban seems to have abated. Still, Tunisian society remains starkly divided on social issues and plagued with economic problems. If the new democracy here is to survive, there must be some steps towards reconciliation.